4 out of 5 based on 7 ratings. From bestselling author Kaitlyn Davis comes a paranormal romance perfect for fans of Twilight, The Vampire Diaries, and Buffy The Vampire Slayer. 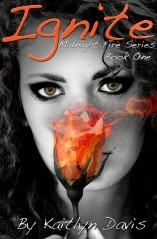 Ignite is the first book in the Midnight Fire Series and it is approximately 65,000 words. “With one last look, one final search of the lines of his face for some sign, Kira turned and ran away from the sound of the man she loved laughing in the face of her death.” When Kira Dawson moves to South Carolina, she meets Luke, a blond goofball who quickly becomes her best friend, and Tristan, a mysterious bad boy who sends shivers down her spine. Kira knows they’re keeping secrets, but when she discovers Tristan’s lust for blood and her own dormant mystical powers, Kira is forced to fight for her life and make the heartbreaking decision between the familiar comfort of friendship and the fiery passion of love.